SWBAT use counting back as a strategy to find the difference in single digit numbers. Smack down! In this lesson students will learn how to count back to subtract. Counting back from a number is a strategy that builds children’s mental math skills. Children begin to identify patterns as they count back, allowing them to understand the relationship between the numbers they are counting. This lays a foundation for adding and subtracting greater numbers and recognizing patterns between numbers within 100. One way for children to remember where to start counting back is through concrete examples. 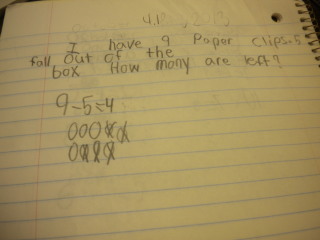 In first grade students realize that doing mathematics involves solving problems and discussing how they solved them. Getting the student to look at the answer ans ask themselves "does this make sense?" is a key to MP1. Challenge volunteers to give counting directions for the rest of the class to follow. How can you count back to find the difference for 9 – 1? How can you count back to find the difference for 9 – 2? How can you count back to find the difference for 8 – 1 ? I have children find the difference by using the counters to count back. Then I have children record the difference. I use similar questioning for 9 – 3. I try to focus on children’s understanding of counting back 1, 2, or 3 to subtract. I have children count back from 10 to 1 to help them learn the pattern. For the independent practice on this lesson, I use count back worksheet to allow students the opportunities to problem solve independently. To extend the thinking, challenge children to find a way to check their answers. For example invite volunteers to share their methods with the class. If no one uses addition to check the answer, you might ask the children to figure out a way to undo counting back by counting on. Tell children to count back 3 counters by turning over each counter as they count back 3. Continue using the same technique asking students to find several other counting back differences. In this video, one of my struggling students still had difficulty with counting back, so he continued to use counters to subtract. I have 9 paperclips. 5 paperclips fall out of the box. How many are left? I like to use journals as a quick check for understanding. This also allows the opportunity for students to write about their learning.